Blackberry, blueberry, raspberry… all wonderful when paired with coconut. And then turned into “cake” = magic. I got inspired to make this recipe from these blueberry coconut bliss balls — something I’ve been whipping up a lot the last few weeks. Somehow in the middle of one of the batches, bliss balls in cake form sounded like a good idea. Because… what could be better than a delicious, jam and coconut-centric recipe except… more jam and coconut, right? OK, maybe by some definitions this isn’t really a cake cake. 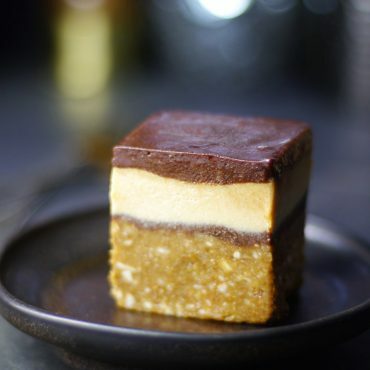 There is no baking involved, and the cake layers aren’t exactly a traditional type of a cake. But you know what, it’s delicious, and easy to throw together. Plus it requires no eggs, gluten or gluten substitutes, binders, dairy, oils, or sugar (not even grains or nuts), and is perfect for those perpetually worried about burning their cake, or having it sink in the middle (you know who you are… ;) ). If you like coconut and berries (you can use any cooked berry jam of your choice — raspberries were wonderful — tested that for ya), and if you don’t love running the oven, this dessert is probably right for you. The flavor of it is a bit reminiscent of the *good* taste in a wedding cake. Step one is a bit drawn out because of the additional chilling time to create 2 even layers of this cake. You can make it a lot shorter if you have 2 springform pans of the same size by cutting down on some of that freezing time. The cake layers are a little fragile, so handle with care when transferring them or when slicing the cake. On the blueberry bliss balls recipe (which forms the base of this cake) many people asked if they can substitute the coconut flour with another flour. 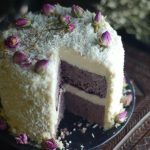 Sadly the answer is no, as coconut flour is very unique in its properties and this cake was tailored specifically for it. 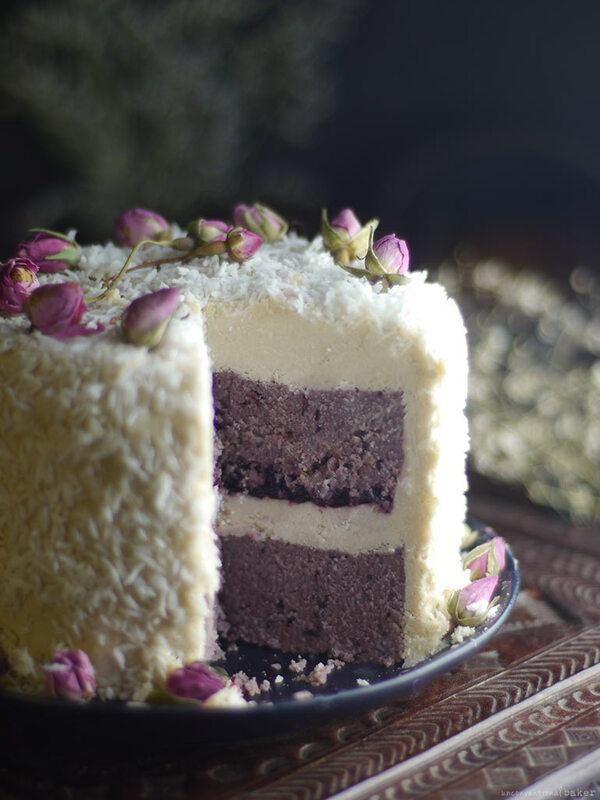 And last but not least, if you want to change the size of the cake, you might find the downloadable recipe sizing up / down guide further down this page handy. 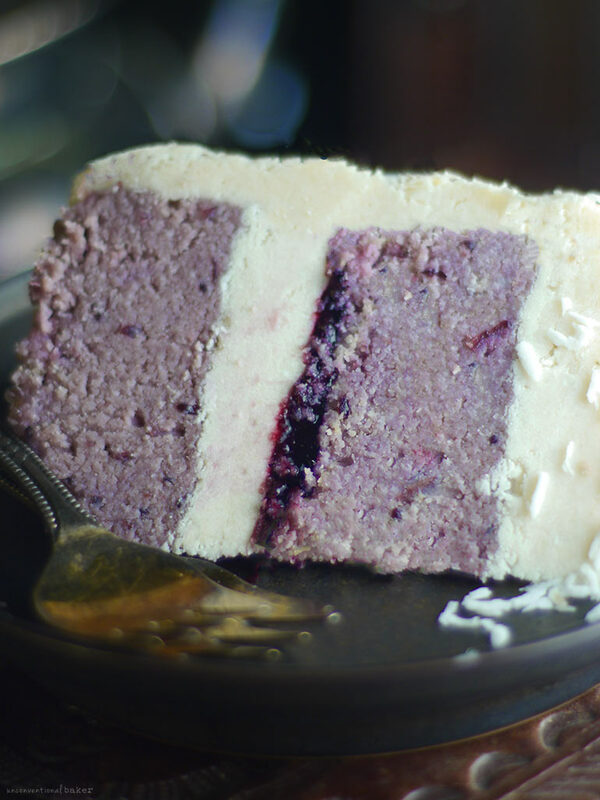 Layers of blackberry jam, coconut, and billowy frosting in a gluten-free no-bake cake. Delicious and rich, and perfect for when you want cake but don’t want to turn on the oven! CAKE: Process all cake ingredients in a food processor into a uniform mixture. Allow it to sit for a minute. Scoop out half the mixture into a 5″ springform pan and press down into an even flat crust (compress it as much as you can). Freeze for 30 mins, then carefully un-mold and transfer onto a plate and place plate and crust back in the freezer. Fill the springform pan once again with the remaining half of the mixture and press down into an even flat crust. Freeze while working on the next step. FILLING: Make sure all frosting ingredients are at room temperature. When ready to frost, blend them in a high power blender (I used my Vitamix for this) and process into a smooth consistency. ASSEMBLY: Remove the springform pan from the freezer (having it chilled like this helps the filling to set faster) but leave the base layer inside the pan latched. Evenly spread about 1/2 cup of the frosting over the base layer into the pan. Chill for about 5 mins in the freezer, then carefully spread the additional filling jam over the frosting. Carefully cover with the second frozen cake layer. Press down very gently to make sure it’s secured into place. Return the cake to the freezer for about 20 mins for the filling to set. Then remove the cake from the pan and frost the top and sides with the remaining frosting. 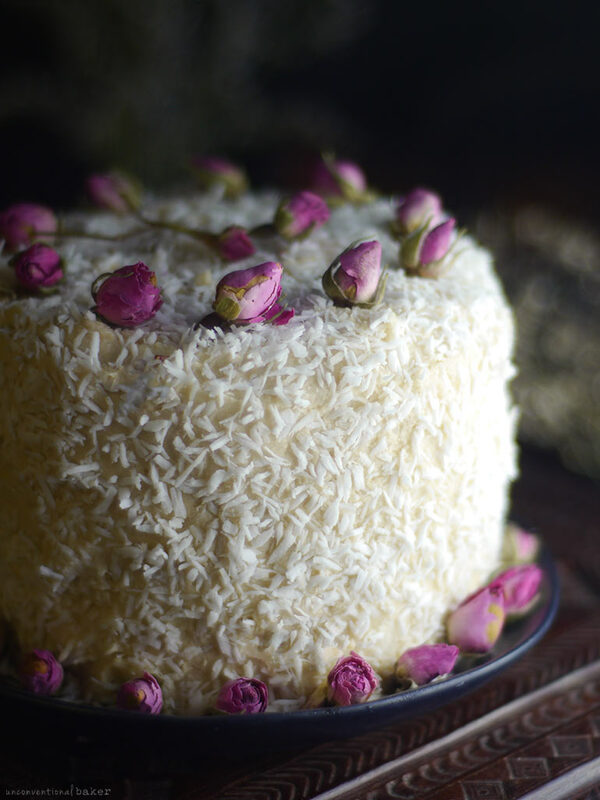 DECORATING: take handfuls of shredded coconut and carefully press them to the sides of the cake. Sprinkle the top of the cake with additional shredded coconut. Decorate with dried flowers if desired. Place the cake in the fridge for 30 mins to set and firm up. When ready, carefully slice, serve and enjoy! Keep leftovers refrigerated. This recipe contains affiliate links to the edible roses and cake pan I used to make it. Love the look of this cake….But what did I do wrong???? The frosting was thin, as thin as the layer of jam. I messed up some where? I used a 6″ springform pan. Can that be the problem? Thank you for sharing all your amazing recipes. Hi Audrey! I’m making this cake this week as part of my menu! So excited. Will let you know how it turns out. You are genius!! I made this a couple years ago and it was super yummy! I would not have guessed there’s no baking involved. Highly recommend this recipe! forgot to give this stars. Thanks you, Sharon :) ? This cake turned out so beautifully! Very simple to make and absolutely delicious! Thank you!! So happy to hear, Val! Thank you so much for the feedback :) Glad you liked it! Hi, I’m about to make this wonderful looking cake. What is the best way to store it before I serve it? Should I keep it frozen in the freezer or store it in the refrigerator ? I’m making it a day before I plan to serve it. Thanks! Sorry for the delayed reply. You can just refrigerate it until serving time. It’ll keep well. Wow, wow, wow! This is brilliant – I love it sooo much! I’m not sure which aspect I love the most, the colour or the rosebuds. Perhaps all of it. It’s truly a feast for the eyes! This look super delicious, Audrey. I love the coconut flavor, can’t wait to taste this! Hi Audrey!! I’m planning to bake this for my friends living in Thailand so I’m gonna have to carry the cake onto the plane for a 2 hours’ flight. Do you think that this can last the entire journey? It’s around 31 degree celsius in Bangkok right now..
What I do for a makeshift freezer is just get one of those “cooler” shopping bags (you know, the kind lined with aluminum-looking stuff on the inside), and then line the bottom with ice packs (or a few frozen water bottles). Then place the cake on top in a sealed container, and then put a few more ice packs (or frozen water bottles) on top. Then close the bag off (either zip up fully if it comes with zipper, or just wrap the top tightly and use an elastic or something to keep the cold contained. I made this yesterday and it was PERFECT! I wasn’t sure if my husband would like a raw cake, but he enjoyed it. I don’t eat many sweets (I’m a dark chocolate kinda girl), but this cake was super yummy. I’ll definitely make it again. My only suggestion would be to buy 2 pans and save the extra step. Oh my goodness; this looks AMAZING! Blackberry and coconut are two of my favorite things!! :) How long would you say it lasts in the refrigerator? Thanks! Well, it is a very small cake, so I suspect it wouldn’t last all that long at all ? But in terms of perishability, I’d give it 5 days to a week in the fridge. You can also freeze it and then thaw out in the fridge overnight… Although I found that freezing it first made the icing crack a tiny touch on the inside (because the coconut really firms up and then settles in a different way) — no biggie for just enjoying the cake, but for an event I’d probably make a fresh one. It’s good up to three months in the freezer though. Hi Audrey …great looking cake for sure…excited to make it …and taste it!! However I’m trying to see how the measurement of the coconut butter 3/4 c with 4 tbsp of milk making enough to have that deep lush looking frosting? That looks like 1/2 ” ?? Thank you so much … As I’m a newbie to being off sugar and glueten and carbs for a 10 day detox …every thing I see …I want to include once in awhile with a clean living diet… But you can bet I’ll be rotating this in a lot,!???? Thax berry much, blackberry anything is my fav…??? Thanks so much, Betty. And well, it’s a really tiny cake :D That explains the small amount of frosting required. However, you can always make more frosting and enjoy it with a spoon in hand if you want to make sure you have plenty to spare ? lol happy to share, but is this like a subtle request for more? ? What I like at this recipe is its originality! Its certainly the most interesting cake I have recently seen! Beautiful, Audrey, thanks for this recipe! Would coconut milk work for both milks or does one need to be something different? It’ll probably make the cake MORE coconutty….but I don’t mind that. :) I just haven’t found a good non-dairy milk otherwise without all the fillers! My mental image when you said “bliss balls in cake form” is just a bunch of spheres smushed together and then quickly covered in frosting to hide the bumpy blob haha? But you classed it up much more than that, this is beautiful! 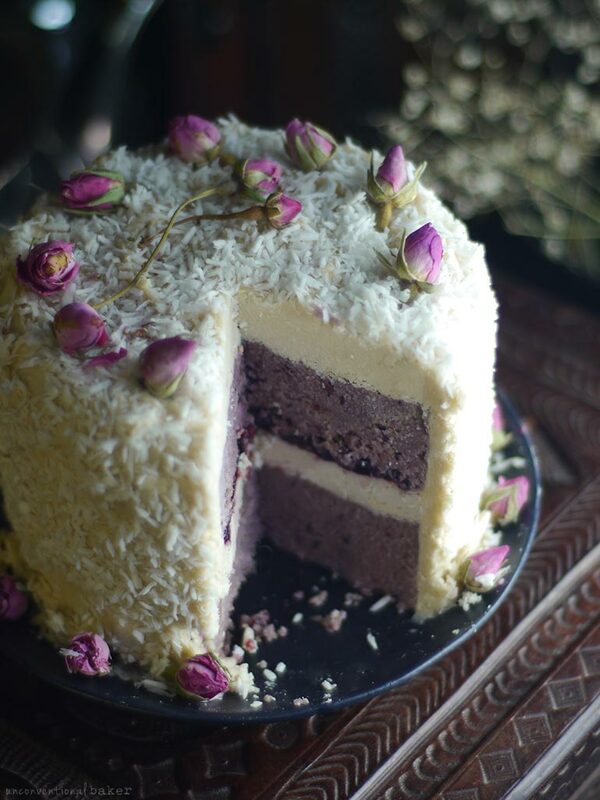 And the surprise of slicing though all that fluffy coconut to find purple cake inside would certainly be a fun moment (of course if I made it myself I would have to act like I didn’t know it was coming :D) Bliss balls are nice for ease, but I think with-frosting sounds even better! Haha. Hard to surprise yourself, isn’t it? ;) Oh gosh, bliss balls lumped into a cake sounds bizarre! ? Still working my way through all that coconut flour btw ? Just finished the last of it actually ? Thanks so much, Sara! :) Enjoy it. 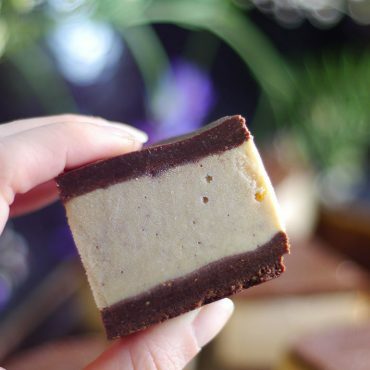 What a brilliant use for coconut flour! And I’ve never had blueberry jam but, considering it’s one of my fave fruits, I bet it’s delish! What?! Never?! Really? It’s so good though :) and works well in something like this. I’ve seen people made the bliss balls with regular berries and sweetener instead and they said it turned out delicious, but not colorful (because the jam is so much more concentrated).